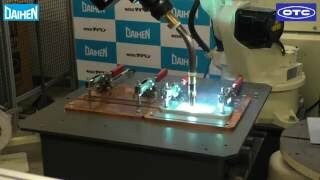 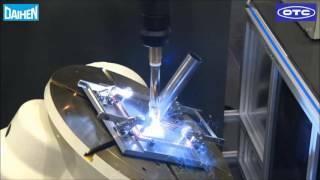 Full circumferential welding with a 7-axis robot. 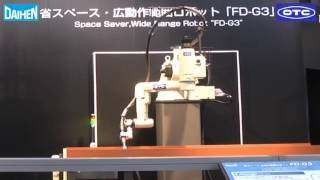 Flexibility of the 7-axis robot to deliver whole circumference welding without the need for additional positioners. Pipe periphery welding with a cold tandem welding system In ordinary MAG welding the molten pool is cooled by inserting a filler wire to minimize distortion via a low heat input. 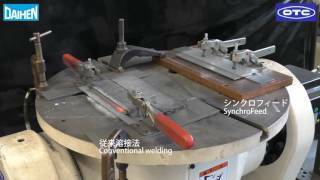 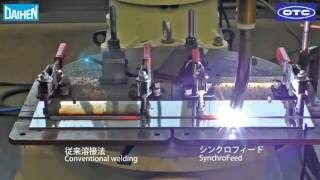 Synchro-feed welding system2 Ultra-low spatter welding of soft steel (t3.2mm, lap fillets). 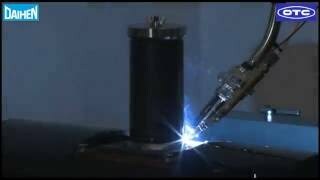 Synchro-feed welding system Ultra-low spatter welding resulting in 98% reduction of weld spatter. 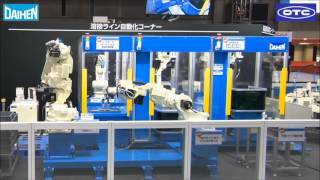 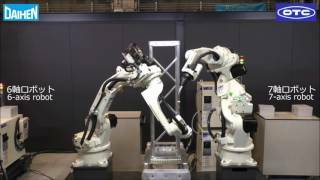 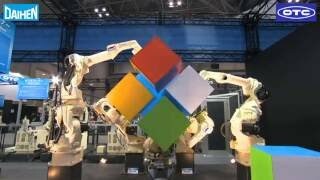 7-axis robot performance videoThe flexibility of a 7-axis robot makes high density installations posibile with minimal space for equipment required. 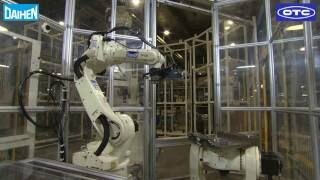 Transport between processes in 3 cells with the 7-axis robot The flexibility of the 7 axis robot, allows workpiece transport between 3 cells using 1 robot, reducing equipment costs. 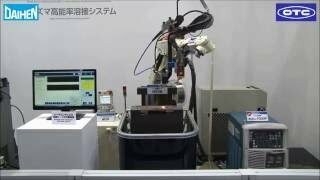 costs, and setup times were greatly shortened. 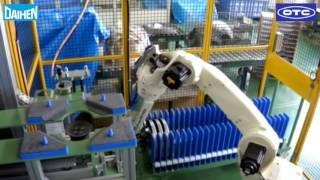 Bolt palletizing system Dimension calculation and palletizing while using the small handling robot. 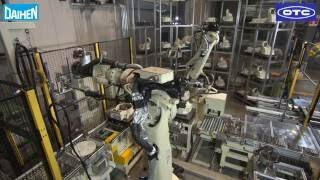 Screw-driving robot system An automated system that uses a robot for everything including: picking up bolts, applying screw lock materials, and screw fastening. 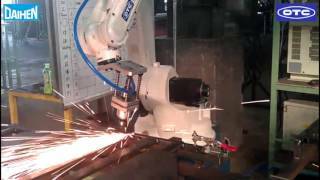 Transformer casing automatic welding system Fully automated welding system with a large handling robot and an arc welding robot. 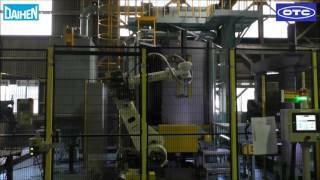 Transformer case material handling robot Material handling to and from the shot blasting equipment with a large handling robot. 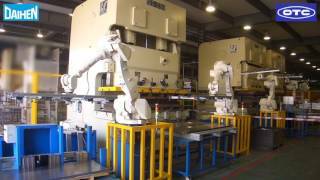 Parts loading to the press machine Hard labor by 4 operators is automated by robot.Productivity and safety has been improved. 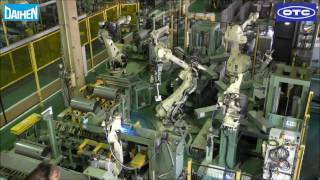 Conveyor robot between presses Achieving automation of simple work by 3 robots.Productivity and safety has been improved. 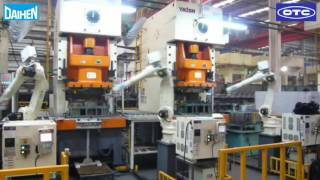 Parts loading/unloading to the press machine Automated parts loading/unloading.Parts are loaded onto the pallet orderly by palletizing-function. 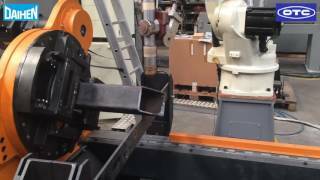 Parts loading/unloading to the pipe bending machine Achieving un-manned parts loading/unloading to the pipe bending machine.Productivity has been improved. 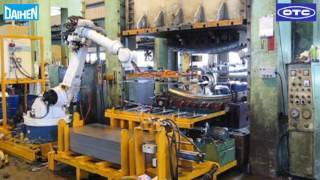 Parts loading/unloading to the forging machine Heated parts loading/unloading which requires speed is automated by robot. 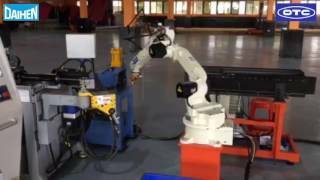 Automatic polishing of welding bead Polishing operation after welding process is automated.Robot has released operators from dust environment. 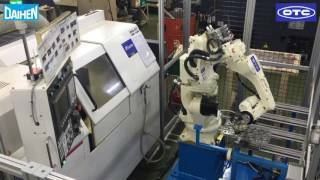 Parts loading/unloading to the machine tool by 7-axis robot 7-axis robot goes around the front of machine tool and achieves parts loading/unloading by its incredible flexibility.It can be installed without blocking the front side of machine tool. 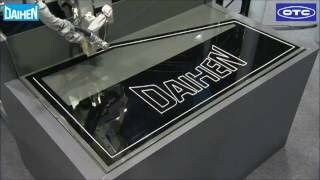 Laser cutting with a world class highly accurate robot High-Accuracy robot for small circle cutting, saddle shape 3 dimensional cutting and straight line cutting. 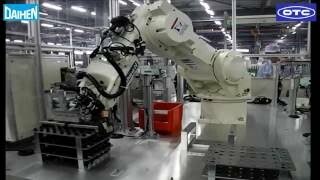 World-class straight track and circular arc track accuracy across the entire work envelope. 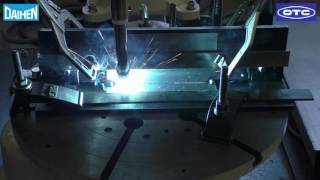 High-speed sealing system Stable sealing can be done even at the maximum 1.5m/sec. 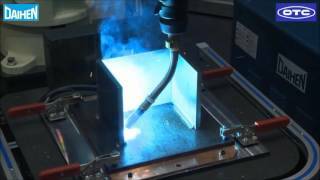 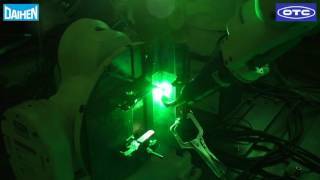 Plasma welding system.Using a concentrated plasma arc, and key hole (penetration), a weld can be done in one pass. 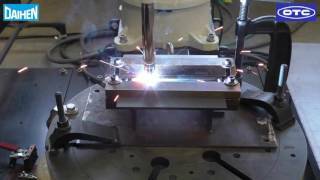 For medium steel plates, welding time is greatly reduced compared to TIG multi-layer welding. 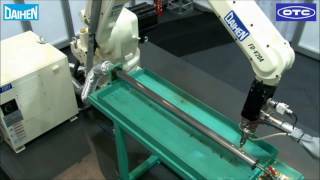 A horizontal articulated robot cuts steel I-beam.Daihen's proprietary horizontal articulated robot structure produces a wide range of movement. 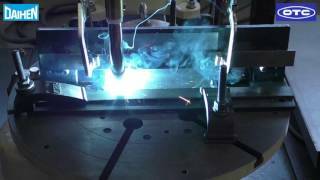 Plasma cutting systemSquare pipe cutting and slit and hole processing with a highly accurate robot and positioner. 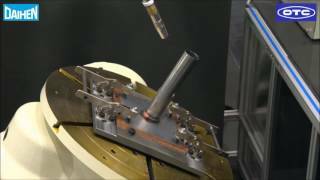 Machined part deburring A flexible, robotic deburring cell incorporating machine vision for part location. 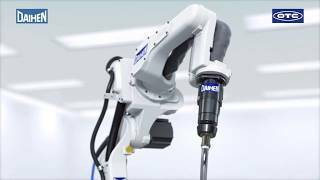 A full set of rotary deburr tools are accessible via an automatic tool-change system on the robot end-of-arm, supporting a variety of finishing bits and supporting redundant tooling to manage expected bit wear. 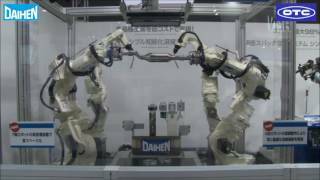 Force-feedback guided robotic assembly. 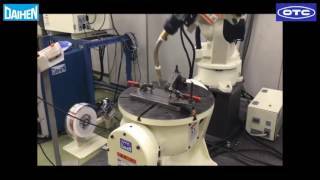 Our reduction gear is assembled incorporating a force sensor mount to our robot end-of-arm. 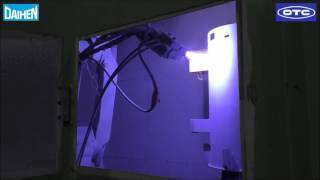 Thermal spray robot. 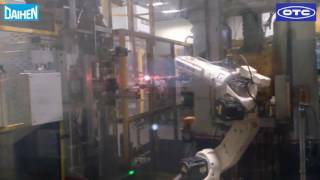 Robotic thermal spray application. 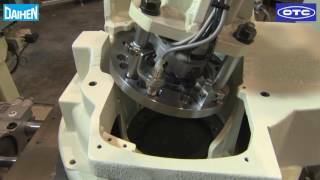 to product details and estimates.